Octopus provides an exquisite new item for your menu. With a luxurious texture and a flamboyant flavor, this mollusk has gathered a hefty following in the seafood markets and your diners will be thrilled to see it on your menu. Your fresh octopus from Pucci Foods will please their palate and stimulate their senses in any number of delightful recipes. Unlike squid, octopus is best prepared with long, slow cooking to tenderize the firm meat. If cooked too rapidly, octopus will become tough and chewy. There are many amazing recipes for boiling, grilling and poaching octopus to culinary perfection. Surprise and delight your diners with the addition of a succulent octopus dish on your menu. 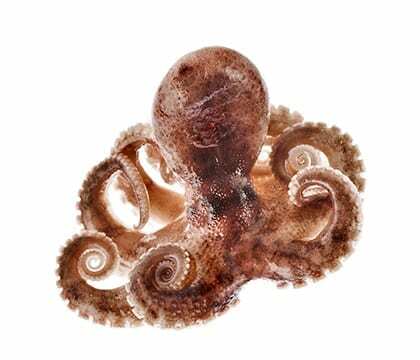 Octopuses grow quickly and reproduce at a young age, making them very resistant to overfishing. They are typically collected wild using traps or diving and hand capture, so bycatch is almost nonexistent and there is little to no damage to the environment. Octopus therefore makes a beautifully sustainable option. However, the source of octopus is important. The Philippines, Mauritania, Morocco and Vietnam have little to no management of octopus fisheries and there is much concern about habitat damage from certain fishing techniques. Octopus from Spain, Hawaii and the Gulf of California come from well-managed and responsible fisheries. Our team at Pucci Foods strives to protect and conserve our oceans. With a certification of sustainability from the Marine Stewardship Council, we offer fresh seafood options that promote healthy living and healthy oceans. Your clients will enjoy learning that their seafood dish comes from a sustainable source. Make your choice to support the future of our oceans and buy your wholesale octopus from us today by filling out the form on this page. A member of our team will be in touch soon.